Special light-reflecting pigments in the Mary Kay® Facial Highlighting Pen optically “lift” the shadowy areas of your face. Instantly your skin looks brighter, your tone more even and your face more radiant. Can be reapplied throughout the day. Supersheer formula to keep you looking refreshed and natural. Easy to blend formula will not settle into fine lines. Want to look refreshed? The convenient Mary Kay® Facial Highlighting Pen allows you to bathe your face in picture-perfect light, conceal small imperfections and apply an instant optical “lift” under your eyes or in other shadowy areas, anytime throughout the day. The highlighting pen is also oil- and fragrance-free, and non-comedogenic. 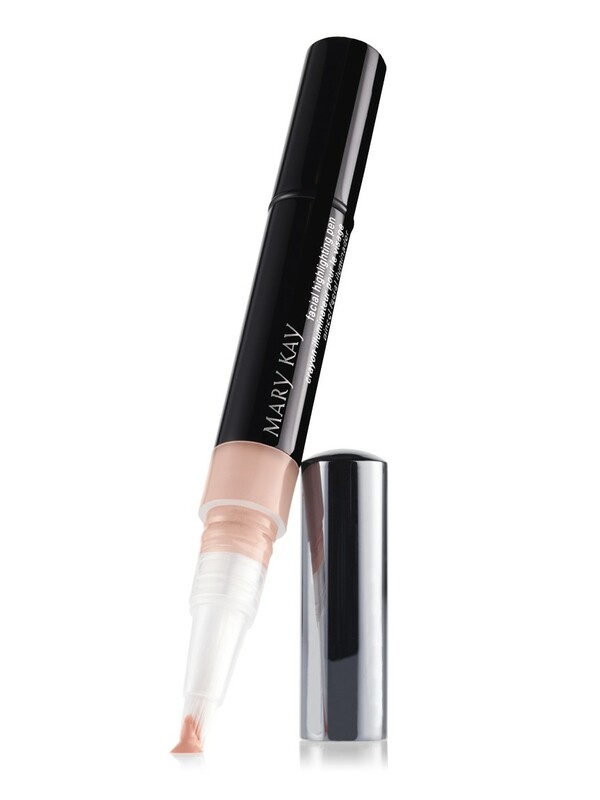 After you’ve applied your concealer and foundation, you’re ready to use the Mary Kay® Facial Highlighting Pen. Slowly twist the pen and release the product. Apply the pen to the shadowy areas of the face, such as the inner corners of the eyes and the sides of the nose. To diminish the look of puffy eyes, apply the pen just below the puffy area. Only highlight the shadow beneath the puffiness (not the puffy area) to “lift” it and make the area more flat. Apply the Facial Highlighting Pen along the smile line to diminish shadows. The pen also can be applied below the lower lip at the crease of the chin. To “lift” the bridge of the nose, apply a stroke of highlighter down the top of the nose from the bridge to the tip. Use your ring finger and lightly pat the edges to blend. Reapply throughout the day to stay looking fresh and luminous. Titanium Dioxide imparts color, opacity and pearlescence to the product or skin. Phenyl Trimethicone helps to maintain the soft, smooth and supple appearance of the skin. Light-reflecting pigments optically “lift” the shadowy areas of the face.